Posted on 12. Feb, 2009 by Corey in NCAA Basketball. 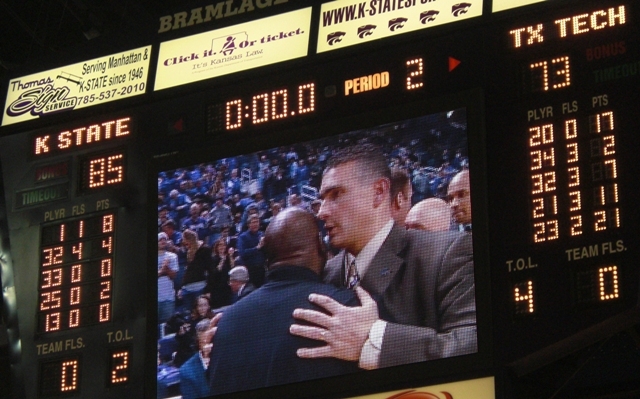 The Kansas State Wildcats entered Bramlage Coliseum Wednesday night riding a five game Big 12 Conference winning streak, after dropping their first four to start the 2008-09 campaign. By doing this, the Wildcats became just the second school in Big 12 history to rally from 0-4 start to get back to at least .500 in league play. But KSU does not want to talk about the past nine games, and hang onto what could have been with a better start. They are playing and living in the moment using their momentum to jump on the Texas Tech Red Raiders early in front of a crowd of 9,941. When the final buzzer sounded, the Wildcats moved to 17-7 overall with an 85-73 victory dropping the Red Raiders to 12-12 and 2-7 in the Big 12 Conference. KSU began this three-game home stand by racing out to a 30-6 lead in the game first 13 minutes. Knight’s words of wisdom did not seem to have much effect as Kansas State was leading 12-2 at the games first media timeout. The lead would expand throughout the half and the Wildcats were up 35-10 with 3:43 to go until halftime. With just under 11 minutes to play in the game, Martin became so disgusted with the play on the floor that he subbed “hockey style,” with a complete line change. Five new players checked into the game and five players headed to the bench. One of the crowd favorites, Luis Colon, received one of the biggest cheers of the night, when he scored his first bucket, his only two points of the game, with 6:33 left in the contest. Colon also led the team in rebounds with nine in his 22 minutes of action. But the loudest ovation of the evening happened with 5:31 to go when Senior Darren Kent left the ballgame with a game high 18 points. The Wildcats would put three others in double figures, Dominique Sutton (12), Jacob Pullen (12) and Denis Clemente (15). With the Wildcats comfortably ahead with 2:42 to go, Coach Martin had all five starters out the game and some less used bench players finish up the action. Then, with 53.6 seconds remaining, the student section erupted with a chant, “Beat KU.” This would continue until the final buzzer sounded. For tip off on Saturday afternoon you can throw all records and history out the window. All that is for sure is that the KSU student body wants to be chanting “We Beat KU” when the final buzzer goes off. – Being an equipment guy all my life, I tend to notice things like uniforms, shoes, etc. so I was interested to see Texas Tech wearing an Under Armor Jersey and Adidas Shoes. TTU had red warm-up tops with a hood on them. Not a fan of that look. – Also not a fan of the entire Texas Tech staff in black polo shirts for the game. Just does not look as professional in my eyes. – A very cool opening before tipoff where a US soldier stationed in Bagdad was on the video board wishing the Wildcats “good luck against the Red Raiders.” Kansas State has a strong military following with Ft. Riley base being so close. – During the game, Kansas State introduced their new University President, Kirk Schulz, and his wife to the crowd to a large ovation. Schulz will be the 13th president in KSU history. – The Governor of Kansas, Kathleen Sebelius, was also present at the game and recognized on the scoreboard. – New Kansas State Football Head Coach Bill Snyder had a short video presentation on the board before being shown sitting in his seats in Bramlage to a large roar from the crowd. Snyder is a legend to KSU Athletic fans and is returning to again coach the Wildcats. – Head Basketball Coach Frank Martin was sporting some nice cowboy boots for the game with his suit. I wonder if it is because he is auctioning off the pair he wore a few games ago for charity. – Found it interesting to occasionally hear Coach Martin giving direction to point guard Denis Clemente or center Luis Colon in Spanish. That is some pretty good strategy. – I also picked up on Texas Tech Head Coach Pat Knight changing defenses (man to zone) mid possession by yelling out “Shark.” Maybe Coach Knight needs to find something else that might work for his team like holding up a picture of his dad Robert Montgomery Knight yelling. – Cannot wait for the students to start lining up and camping out for the Kansas Game seats. Really think that is a great part of college athletics and regret that I never got to have the experience. But like anything else in life, there are rules to this.